Tax credits should go directly to individuals and families as a tax break, not directly to insurance companies as a subsidy (like under Obamacare)—and here’s how they can do so. For most recipients, the full tax credit would be claimed when they file their taxes at year’s end. For those who may not financially be able to pay a year’s worth of insurance premiums before receiving the tax credit, the 2017 Project Alternative allows for the tax credit to be advanced on a monthly basis. 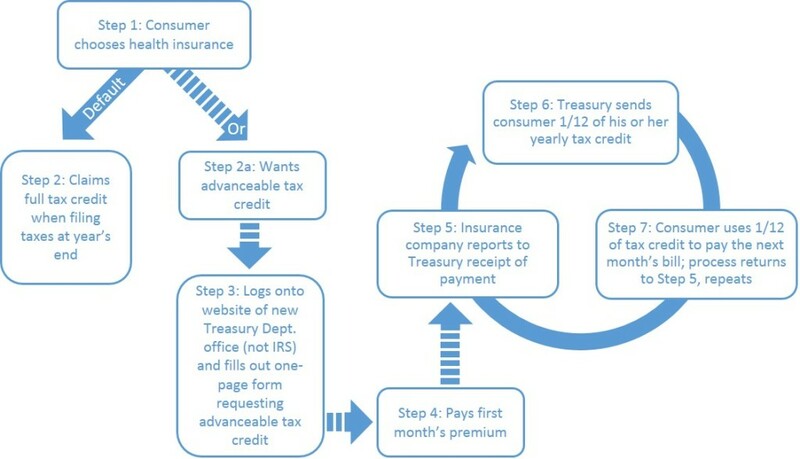 After choosing an insurance plan and paying the first month’s premium, the consumer who desires an advanceable tax credit would log on to the website of a new Treasury Department office—not the IRS—and fill out a one-page form requesting an advanceable tax credit. Each month, his or her insurance company would verify with that new Treasury office that a payment has been received. Treasury would then advance a 1/12 portion of the yearly tax credit to the individual or family, assisting them in paying the following month’s premium. The process prevents fraud by only providing the tax credit each month after the insurer verifies that the monthly payment has been made by the consumer. The tax credit would thus work as a reimbursement. A new poll by McLaughlin & Associates finds that Americans overwhelmingly support a well-conceived conservative alternative to Obamacare.